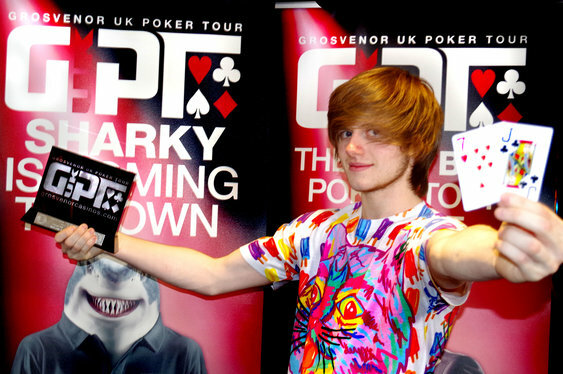 The 2014 GUKPT season bowed out in style over the weekend with colourful Irishman Charlie 'Epiphany77' Carrel taking down a guarantee-busting Grand Final. A top notch field of 212 entrants took to the tables at the Vic creating a bumper £424,000 prize pool. Carrel took the bulk of it after working his way through one of highest quality final tables the GUKPT has ever seen. The final nine included Tour winner Priyan De Mel, 2013 World Series of Poker Europe winner Adrian Mateos, 2013 GUKPT Grand Finalist Will Kassouf, recent WPT Nottingham third place finisher Tamer Kamel and 2009 Irish Open finalist Ben Vinson. After that murderers' row of talent had hit the rail there was the still the challenge of recent GUKPT Reading winner, Paul Vas Nunes for Carrel to overcome. The pair battled back and forth for over an hour before the young Irishman sealed victory. The chips hit the middle on a 3s9s6c8h10d board with Vas Nunes tabling 7c3d for a straight. Unfortunately for him, Carrel revealed Jc7h for the higher straight which was enough to give him the title and by far the biggest live score in his fledgling career. Prior to the win, Carrel's previous live best was an €8,500 score for a 189th place finish at this year's EPT Barcelona.